Whilst we like to make our deaths look reasonably realistic, we don't want to put guests off their dinner or make a huge mess of the venue unless specifically requested. At events we therefore tend to tone down the amount of gore used. For health and safety and legal reasons we don't use real weapons and avoid pyrotechnics other than in very exceptional, carefully planned, circumstances. 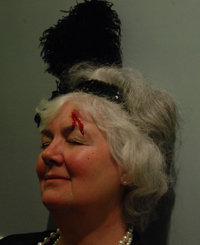 It is possible to arrange workshops in association with Fat Cat Theatre Company which cover the use of make-up techniques to create realistic wounds, burns etc. These workshops are popular with children and adults alike and can involve much more elaborate techniques than we usually use in our mysteries. If such a workshop would be of interest you, please get in touch via the contact page and we can discuss your needs. We will travel further afield, please see our mystery location page for details.